Take a day off from the busy city streets of Marrakech and discover life in the nearby High Atlas Mountains on this full-day excursion. 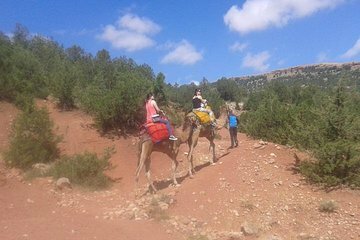 Head off the beaten track in the morning with a camel ride through a juniper forest in the mountains. In the afternoon, travel to Imlil, a village in the High Atlas Mountains over 5,000 feet above sea level, and experience the unique rhythms of life in the mountains as you trek between some of Morocco’s remote Indigenous villages.